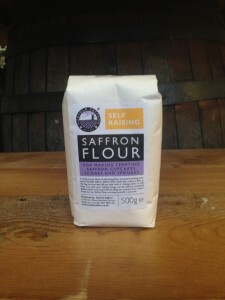 England’s premier modern-day commercial saffron producer is based in Norfolk near Burnham Market. It’s run by Sally Francis, an Oxford-educated botanist with a doctorate in plant pathology. Sally’s helped by her family during busy periods in the year, especially by her mother Jill – probably the most experienced saffron picker in England! Sally is based on her small holding which has been in the family since 1935. They started growing saffron when Jill bought 20 crocus corms for Sally’s birthday present in 1997, though back then there was no intention to go into commercial production! Their stock of plants multiplied up over the years and by 2009 there was too much saffron to use themselves so they took some to a market – and were astounded by the enthusiastic response. Sally used her expertise in ‘alternative crops’ to take things forward, and, with the help of RDPE funding, Norfolk Saffron was born. ALTHOUGH NORFOLK and saffron are two words that aren’t normally associated with each other, Sally discovered that saffron was once very important locally – and it had a reputation for excellent quality too. Huge amounts were exported from north Norfolk ports in a lucrative trade to the Low Countries. After more than a decade’s experimentation and development work, Sally is proud to be the first to offer Norfolk-grown saffron for sale again.